The Korean manufacturer has announced the release of a new 25-inch monitor that supports glasses-free 3D technologies. The new device is called DX2500 and incorporates glasses-free parallax barrier 3D and head-tracking technologies. The DX2500 has also made it possible for LG to receive TÜV Rheinland certification for a glasses-free 3D monitor. In general existing glasses-free 3D products generally require viewers to stay within a tightly restricted angle and distance. The DX2500 removes this restriction with the parallax barrier 3D and head-tracking technologies, allowing viewers greater freedom of movement, enabling a more comfortable user experience. 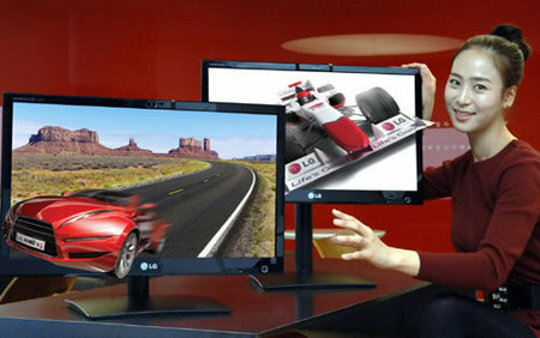 The LG DX2500 is now available in Korea with expected worldwide availability in early 2012. Pricing is unknown.